The original pin count versions, 220 and 440, have already proven their merit in terms of performance and contact design in COM Express applications. Having five more pin count options to choose from now provides hardware developers with more opportunities to optimally adapt the heights and pin counts of the necessary board-to-board connections in keeping with the relevant high-speed application. The new Colibri connectors with 40 to 200 pins also feature optimized contact design that enables data transfer rates of up to 10 Gbps, as well as additional benefits. As such, they are ideal for PCI Express Gen3 applications with 8 Gbps or 10 Gbps Ethernet (10GBase-KR). S-parameters are available on request from ept for use in simulating your proprietary designs. The entire Colibri® connector series, including the new pin count options, impresses with extremely robust design and a high degree of versatility. 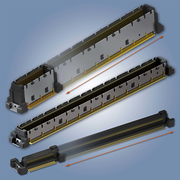 All of the pin count options are available for a board-to-board distance of 5 or 8 mm, thereby guaranteeing maximum flexibility in designing circuit board connections. All Colibri connectors are shipped in tape-and-reel packaging, making fully automatic processing easier.